In my daily ramblings in cyberspace I get to meet a lot of whisky friends from all over the world be it Europe America or Australia. I was fortunate enough to have met a few lovely Danish whisky lovers , one of which frequents Israel so we actually got to meet a couple of times. 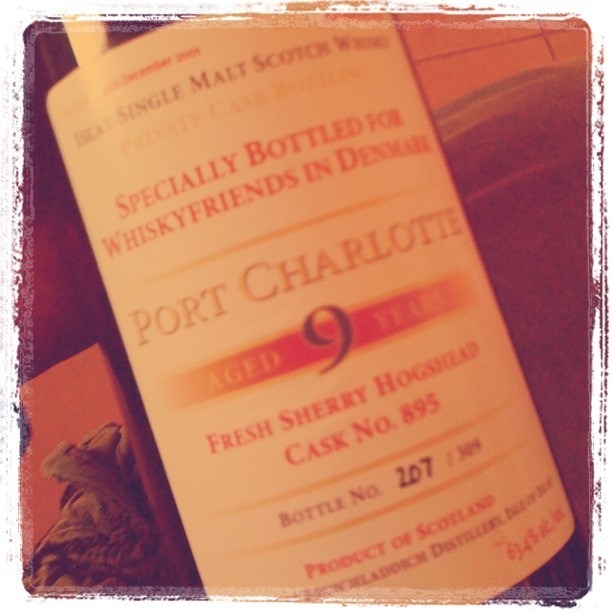 The last time we met, I ended up tasting 5 blind samples sent by @macdeffe owner of the Danish whisky blog, and this time i was lucky to be able to sample a single cask bottling from one his owned casks (and cask shares), and not just any bottling, but a young and kicking Port charlotte. I’ve tasted the official bottling of PC 6,7,8 and liked them quite a bit, so when I heard about this PC9 bottling, i knew i was in for a treat (Steffen told me i had something to wait for, and that the dram was awesome). Normally i would have waited a few days before trying it, but as Jorn wanted to know how i liked it, i set to taste it immediately after i came home. So, here are my wee notes. Nose: Starting with the ‘Signature’ Bruichladdich peated ‘baby vomit’ notes, no doubt here. Sweet, sort of condensed milk stuff, heavy tobacco notes, smoke, peat, and leather with some red berry marmalade. Quite winey but in a good way, those tannins are running wild. Powerful stuff. What a nose! With water the red fruits are more emphasized. Palate: At full cask strength a whopping 63,4% the entry is powerful.With an avalanche of burnt sugar, Crème Brule crust, heaps of bonfire smoke, Ash,Peat embers and the red fruit. A bit of saltiness comes on the 2nd wave, then a few new waves of bonfire smoke. The sherry and the peat interplay is elegant and in perfect harmony, each complementing the other on a different level. Finish : Very long, bitter sweet with wine notes, and ash and smoke going on and on and on and on…..
Jorn asked me to honestly write my impressions, and this is what i am doing. It’s genuinely awesome. Peat and Sherry, Sherry and Peat. When a whisky is well done it can be incredible, and when they do not connect, it’s a disaster. Here, I’m glad to say, they just connect in a perfect way. They coexist, without overshadowing the other, and they are just integrated wonderfully. So, what do i think? This is a cracking dram. A young, peated PC, with a fresh sherry cask. The sky is the limit. at 9 years of age, it’s bottled just in time. Only a few bottles were available for sale, and as far as i understand all are sold. But, if you can put your hands on a bottle, don’t think twice. Get one. Again, many many thanks to Jorn, for allowing me to try this true gem of a dram, and for the bottle!